Harvest aids in cotton are utilized to remove foliage, prevent regrowth and open bolls to allow for timely harvest operations. Timely harvest will minimize yield and quality losses due to weathering. Defoliation and boll opening are natural processes governed by plant hormones and harvest aids are used to speed up these naturally occurring processes. The timing of harvest aid applications is primarily governed by crop maturity, but environmental conditions also play a role in timing of application, the products used and rates applied. The timing of application is based on crop maturity status and there are various methods to determine crop growth maturity when making this decision. 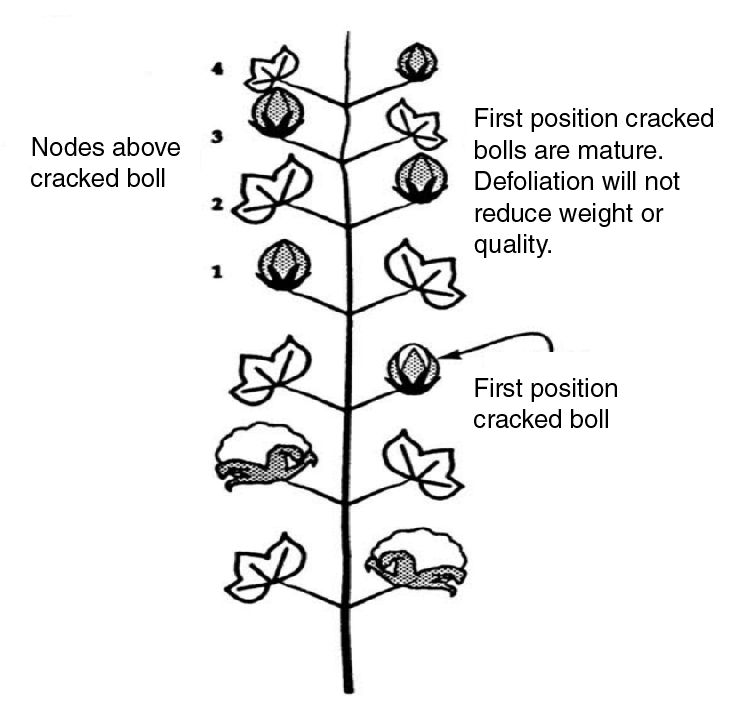 Commonly, it is recommended that harvest aids be applied when the crop reaches four nodes from the uppermost first position cracked boll to the uppermost first position harvestable boll (4 NACB; Figure 1) or when 60 to 70 percent of the harvestable bolls on the plant are open (60 to 70 percent open bolls). Often, these two growth stages are not occurring at the same time. In other words, 4 NACB doesn’t always mean 60 to 70 percent open bolls, so a combination of the two methods may be the best method. Boll distribution, variety maturity characteristics, and management practices will all impact the in-field variability between NACB and percent open bolls. Because of this the timing of harvest aid applications should be made on a field-by-field basis. Even within the same field, the variability can be quite high, so taking into account the status of the majority of the plants in the field is recommended. 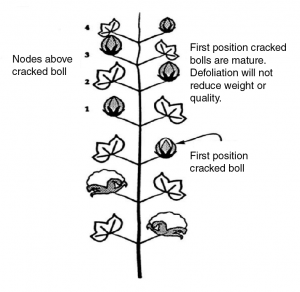 Both of these methods should be based on the amount of harvestable bolls on the plants, so only mature bolls should be taken into account. Figure 1. Determining nodes above cracked boll (NACB). Source: Guthrie, D., Cothren, T., and Snipes, C. 1993. The art and science of defoliation. Cotton Physiology Today Volume 4, No. 7, National Cotton Council, Cordova, TN. While harvest aids can hasten the natural process of defoliation and boll opening, they do not influence boll (or fiber) maturity. Boll maturity can be determined by slicing the boll horizontally to expose the developing lint and seeds. A mature boll should be firm and difficult to slice, with mature seeds (fully developed cotyledons with little liquid or “jelly” in the seeds) with a dark seed coat and the lint stringing-out when the two halves are separated. Slicing the boll also can aid in determining the uppermost harvestable or mature bolls, and which proportion of the bolls should be considered when evaluating percent open or NACB. For example, with favorable conditions, mature bolls can be expected to open following a harvest aid application, thus any bolls that are not at least getting close to reaching full maturity should be omitted from the percent open or NACB determination. A wide array of harvest aid products are available for use in cotton. These products typically fall into one of four general categories: boll openers, defoliants, regrowth inhibitors and desiccants (Table 1), although there are products available that may serve multiple purposes. For example, boll openers (active ingredient – ethephon) will provide some level of defoliation, especially in warm sunny conditions. The selection of the appropriate product(s) should be based both on the crop condition and what action is needed (leaf removal, regrowth inhibition and/or boll opening) to prepare the crop for harvest. The environmental conditions at application and in the short-term (five to 10 days) following application will impact the selection, while the yield potential of the field will influence the amount of financial investment that is justifiable (Table 2). Tables 1 and 2 provide harvest aid recommendations and general information on the function of different active ingredients, common trade names of products and their rates. As always, follow the label regarding use rates and addition of adjuvants. Many product labels also will include information on rates based on environmental conditions (mainly temperature and humidity). Spray coverage is key with carrier volume being critically important. Recent work from across the Cotton Belt has determined that a carrier volume of 10 to 15 gallons per acre results in adequate coverage to provide a rapid and effective defoliation and regrowth inhibition. Ground speed – slower speeds tend to allow for better coverage, particularly in terms of penetrating the crop canopy. Terminal regrowth – typically caused by excess moisture and/or excess nitrogen in conjunction with temperatures that favor growth. Can be significant if conditions are present that are favorable for vegetative growth and can lead to high module moisture and lint staining. Typically controlled by defoliation products (tribufos or PPO), but leaf removal will be key. It is undesirable to desiccate the crop and have the leaves stick to the top of the plant, particularly if harvesting with a picker. Plant growth regulators (PGRs) will not affect or inhibit regrowth – internodes on regrowth are compact and leaf area is only reduced 5 to 10 percent, while leaf thickness will be increased. By the time regrowth is observed, PGRs will not have an impact on internode length. Basal (juvenile) regrowth – can occur after plant has been defoliated in conditions that favor growth. Primarily when sunlight is able to penetrate canopy and initiate growth on the lower axillary nodes of plants. Often seen in fields where verticillium wilt has resulted in premature defoliation. If verticillium wilt is present and caused significant defoliation, watch for the initiation of regrowth at the bottom of the plant. Tribufos or PPO defoliant, or thidiazuron + diuron products are typically effective in removing juvenile regrowth. Minimum time for harvest aids to fully affect the crop; this will increase with adverse conditions (cool weather, drought toughened plants, etc.). Table 1. Active ingredients, common trade names, and application considerations. COC – crop oil concentrate; NIS – nonionic surfactant; MSO – methylated seed oil; AMS – ammonium sulfate; UAN – urea ammonium nitrate; PHI – pre-harvest interval. Folex 6 EC (Amvac) Tribufos Reduced activity under low temps, low humidity, or stressed plants. Use higher rates under these conditions. ETX (Nichino) Pyraflufen-ethyl Addition of COC recommended. Aim EC (FMC) Carfentrazone-ethyl NIS required at higher temps, COC required at lower temps. 7-day PHI. Resource (Valent) Flumiclorac pentyl ester Addition of COC or MSO; NIS if warm, sunny conditions. Sharpen (BASF) Saflufenacil Addition of MSO + AMS or UAN required. Thidiazuron (Arysta) Thidiazuron Higher use rates and addition of COC with temps < 65 F, or in drought conditions. Thidiazuron alone not typically recommended due to low overnight temps in the High Plains. Redi-Pik (Mana) Thidiazuron + diuron Minimum 12 hours rain-free after application for optimal performance. Higher rates required if low humidity is present. Several other trade names Ethephon (6 lbs. ethephon/gal) 7-day PHI. Minimum 6-hour rain-free period for optimal performance. Higher rates under cool and/or dry conditions, or on toughened/drought stressed foliage. Gramoxone SL 2.0 (Syngenta) Paraquat (2 pounds paraquat/gal) Addition of NIS recommended. Table 2. Harvest aid decision table (all units in per acre basis). This lists several available options but is not mean to be exclusive. 1 Actual rates needed will depend on weather conditions (high and low temperatures, humidity). Higher label rates are typically recommended under cooler and dryer conditions. Check the label for specific details on rates. 2 FB = followed by. 3 Rates will depend on product selected; check the label for appropriate rates for the selected product. No more than: 3.2 ounces per acre total of Aim EC, 2.0 ounces per acre total of Display, 2.0 ounces per acre total of Sharpen, 3.4 ounces per acre total (no more than two applications) of ETX, and 14 ounces per acre (no more than two applications, max of 8 ounces per single application) of Resource may be applied during the growing season. 4 No more than 32 ounces per acre of 2 pounds paraquat active ingredient or 21 ounces per acre of 3 pounds paraquat active ingredient may be applied as a harvest aid in up to four applications. Subsequent applications should depend on the green leaves remaining and the rate applied in the first application; use higher rates if excessive regrowth is present. 5 Labeled tank mix partners for paraquat include Folex, ETX and Sharpen. Short stature (12 to 14 inches); low/limited yield potential (less than 500 pounds per acre). PPO inhibitor defoliant (rates vary) with or without the addition of a boll opener. Paraquat formulation at 8 to 16 ounces (2 pounds) or Paraquat at 5.3 to 10.7 ounces (3 pounds). Medium stature (15 to 24 inches); 500+ pounds per acre yield potential. Ethephon (6 lb.) at 16 to 42 ounces or (ethephon + cyclanilide) at 16 to 42 ounces tribufos at 8 to 16 ounces. Ethephon (6 pounds) at 16 to 42 ounces or (ethephon + cyclanilide) at 16 to 42 ounces + (thidiazuron + diuron) at 3 to 8 ounces. PPO inhibitor defoliant (rates vary)3 + tribufos at 8 to 16 ounces or PPO inhibitor defoliant at 0.6 to 8 ounces3 + (thidiazuron + diuron) at 3 to 8 ounces. Paraquat at 6 -24 ounces (2 pounds) or paraquat at 4 to 16 ounces (3 pounds) + tribufos at 8 to 16 ounces. Stripper-harvested only. Paraquat at 6 to 24 ounces (2 pounds) or paraquat at 4 to 16 ounces (3 pounds) + PPO inhibitor defoliant (rates vary).3 Stripper-harvested only. Paraquat at 4 to 8 (2 pounds) ounces FB paraquat up to 32 ounces total (2 pounds)3 or paraquat at 2.6 to 5.3 ounces (3 pounds) FB Paraquat up to 21 ounces total (3 pounds)4 Stripper-harvested only. (Ethephon + urea sulfate) at 48 to 64 ounces + (thidiazuron + diuron) at 3 to 8 oz. Ethephon (6 pounds) at 21 to 42 ounces or (ethephon + cyclanilide) at 21 to 42 ounces + (thidiazuron + diuron) 3 to 8 ounces. (Ethephon + urea sulfate) at 48 to 112 ounces + (thidiazuron + diuron) at 3 to 8 ounces. Desiccating application for stripper harvest preparation (not to be used for picker-harvested cotton). Paraquat at 16 to 32 ounces (2 pounds) or paraquat at 11 to 21 ounces (3 pounds). Conditioning treatment for late-maturing cotton. Apply after daily heat units drop below 5, target seven days before first killing freeze date. Paraquat at 4 to 16 ounces (2 pounds) or paraquat at 2.6 to 10.7 ounces (3 pounds). Ethephon (6 pounds) at 21 to 42 ounces.